I know I promised pictures of recent stash acquisitions in this post, but I haven’t had time to compile a proper post, so today I’ll show you my Lucky Surgery Socks and current WIPs! Notes: None. 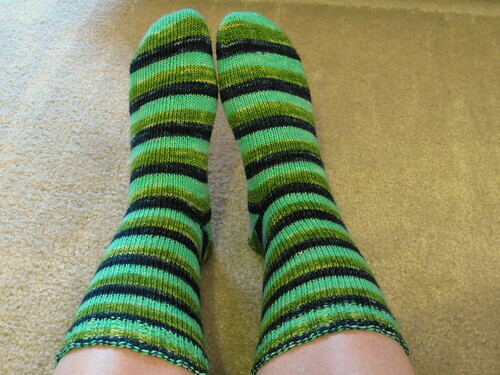 Once again I have to say how much I love these striping socks and Vesper yarn. Only down side was that the dark green yarn stained my needles. Not surprised as dark green tends to do that with wood, but I’m always a little bummed when it happens. I’m so glad I was able to get these done in time! Even got to wash and block them. In my last post, I mentioned Decimal. I got the yarn and started it almost right away. So far it’s been a pretty easy knit. I like how the yarn knits up, but I’m not a big fan on how splitty it gets at times. Hasn’t been too much of an issue, but occasionally it gets me. I’m just past the lace border. I decided to do 3 repeats like others have and I’m glad I did. I like how it is progressing. 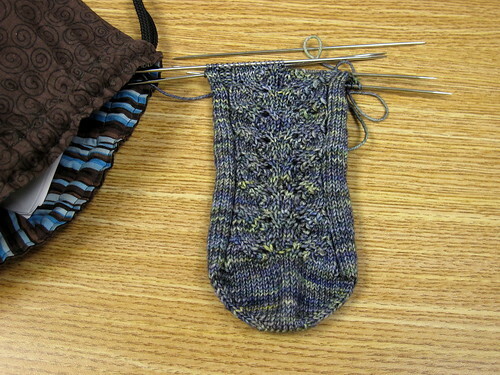 I’ve been working away on my Baudelaire socks. 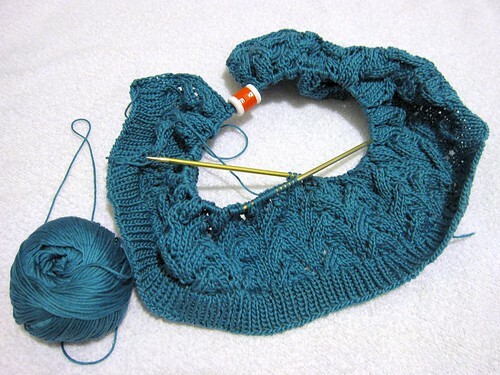 Just started the gusset increases. The photo is from just before I started the gusset increases, but it shows the color of the yarn pretty well (compared to my last black and white photo of it). Healing thoughts are with you right now and for days to come. Still thinking of you and keeping the good vibes coming.